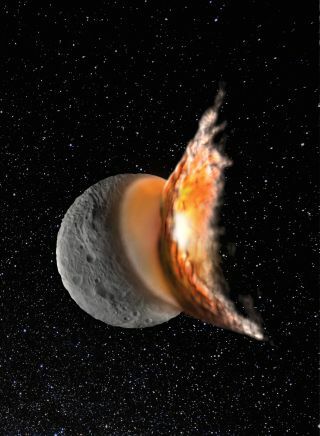 The young asteroid Vesta started off as a round protoplanet, but a massive collision early in its life caused it to become more elliptical in shape and created the giant crater Rheasilvia, scientists say. This image is an artist's illustration of that catastrophic event. Image released Feb. 13, 2013. This topographic map from NASA's Dawn mission shows the two large impact basins in the southern hemisphere of the giant asteroid Vesta. Rheasilvia, the largest impact basin, is 310 miles (500 kilometers) wide. The other giant basin, Venenia, is 250 miles (400 km) across and is partly beneath Rheasilvia.